So is the Supervision TV-Link actually worth buying? It's worth assessing it's merits in a couple of categories when answering this question. In all honesty, it would be extremely difficult to recommend the Supervision itself to anybody as an actualy gaming device. It failed for a reason. It's games were largely terrible and, while they can now be enjoyed in an ironic way, or from a historical perspective, playing them through the TV-Link doesn't improve the vast majority of them in any way. Given the extreme rarity of the device and the fact that, ordinarily it sells for hundreds of Euros on ebay, it's not a purchase we would ever describe as a must have. 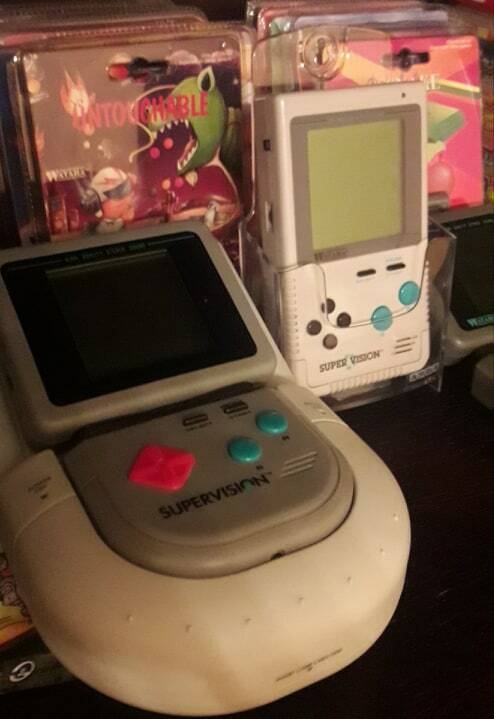 ​Supervisions are terrible handhelds but they are cheap and easy to find. This is still the same terrible hardware but it sure ain't cheap! On the other hand, if you are interested in a quirky and genuinely fascinating piece of gaming history (and, hey, why else are you reading this) that will likely disappear from the market entirely in the next couple of decades then now might be the time to obtain one. We paid 100 Euros for our unit and this is certainly not a bank busting amount and felt like a reasonable investment. It's something we'll use from time to time when playing a new Supervision pick-up. It definitely has the feel of something special that will enhance any collection and is certainly a hell of a conversation piece. As normally opposed as we are to the idea of cartridges as wallpaper and buying things merely for them to sit unloved on the shelf of hoarders, there is a certain aesthetic appeal to the TV-Link. The original bendy handheld, well widely mocked by some, has always been a thing of aesthetic beauty to our eyes and the spaceship style design of the TV-Link and the way the handheld sits so beautifully at rest inside of it has a quality to it that can't be undersold. Consider what you could buy with the kind of money you're likely going to have to spend on this unit. Those really expensive NGPC clamshells? An entire system library for some obscure 8 bit computer? What's going to give you the most joy? If you can pick up a TV-Link at the sort of reasonable price that we did then go for it, but be wary of spending double that amount or more. We've heard stories already from other buyers of this 'new-old stock' that tell of problems far greater than some scrambled up letters. it does seem that the hardware is eventually doomed to cease working through bit-rot and other internal issues. Unless you are skilled in repairing these things then you could end up with your investment going down the drain. On the other hand, maybe you get a lot of joy from just having a bulky lump of plastic with an unfeasibly silly handheld docked in it sitting on your shelf. What are we? IGN? We'd love to read your opinions on this, so please comment below if you've enjoyed this article...or you just want to tell us how utterly wrong we are!